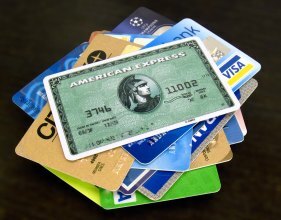 Love them or hate them, credit cards are part of our lives. In the U.S. there are about 700 million credit cards, about two for each American, charging an average interest rate of 13.5 percent. And a lot of us have been fed up with high fees and unfair practices that cost us big. A new law could bring a lot of changes in your credit card bills. It’s called the Credit Card Act of 2009, but most provisions didn’t take effect until February 22nd, 2010. Universal default was the long-hated practice of the credit card company raising your interest rate if you were late in paying a completely unrelated account with another creditor. That’s gone. Under the new law, promotional interest rates are required to last at least six months for existing accounts. For new accounts, your interest rate will stay the same for the first year. Suppose you have a credit card with multiple balances at different interest rates. Under the old rules, your payments would be applied to the lower rate balances first – leaving the higher-rate balances to accrue lots of costly interest charges over time. No more. Now, your payments will go toward the balance with the higher interest first, which means you pay down the debt faster, with less total interest. From now on, your credit card statements will have a lot of information that could save your money. You’ll be informed of penalties for late payments. And you’ll be told just how long it will take you to pay off your balance if you only make the minimum payment, so you can plan to pay off your balance faster and save interest. Also, your credit card company has to mail your bill at least 21 days before the due date and give 45 days’ notice of changes in your APR (annual percentage rate), fees, and other terms of your agreement. Credit card companies used to market themselves aggressively to college students, encouraging young adults to rack up debt and take a long time (and a lot of interest) to pay it off. Under the new law, consumers under 21 will need proof of their own sufficient income, or they’ll have to get a cosigner. The new law does not put a cap on interest rates and fees – so buyer beware. Shop around for a low-interest rate card. Try a site such as bankrate.com to find better deals. Although the new law prohibits rate increases on your existing balances, your credit card company can raise rates on future purchases. The new rate can apply to all purchases that are made 14 days after the company sends you a notice of the increase. So you need to read your bills carefully, and stop using your card if you don’t want to pay the new interest rate on purchases. With all these new restrictions in place, credit card companies are creatively inventing new ways to make money. A lot more companies are charging annual fees for their cards now, or adding fees such as a charge for a paper statement. These provisions allow your credit card company to base their rate on the prime rate or other indicators that go up and down. Right now, these indexes are pretty low due to the recession, but watch for your rates to rise when the economy improves. For most other changes, issuers have to give you at least 45 days notice. But there are two big exceptions: the company can close your account or lower your credit limit without notifying you first. If it happens, call the company and ask them for an explanation. You know those ads that entice you to buy furniture or appliances with no interest? Be careful. The new laws continue to allow these arrangements – and remember that if you don’t pay off the whole balance on time, you can be charged interest all the way back to the purchase date.